London and UK restaurants. Fine Dining at Michelin Starred Restaurants. Vegetarian Fine Dining. Not a critic. Kitchen Table is at Bubbledogs, a champagne and hotdog bar in Fitzrovia. The dual venue is by husband and wife team, Sandia Chang and James Knapett, as sommelier and chef both have considerable experience at some of the best restaurants in the world. When booking I was assured by Sandia that vegetarians were gladly catered for, with a vegetarian menu created for my wife to match the evenings menu. Friday night at Bubbledogs is a popular affair, with a queue of bright young things stretching out the door into Charlotte Street. We had arrived early hoping for a glass of champagne to start the night off not knowing about the queue and waiting list, but luckily as we had a booking at Kitchen Table we ushered in after just a short while. We had the second seating at 7:30 and enjoyed a glass of one of the many grower champagnes on offer, a Raventos I Blanc Rose before being ushered through a through a thick curtain at the rear of the room. Kitchen Table itself is a room reminiscent of a one of those small Japanese restaurants and similar to New York's much vaunted Brooklyn Fare and Momofuku Ko, a bar with a 20 or so seats around a kitchen area and pass, with a tasting menu and omakase format. Service is lead by Sandia, with her and Jack attending to diners, and James and a team of 3 creating the dishes. 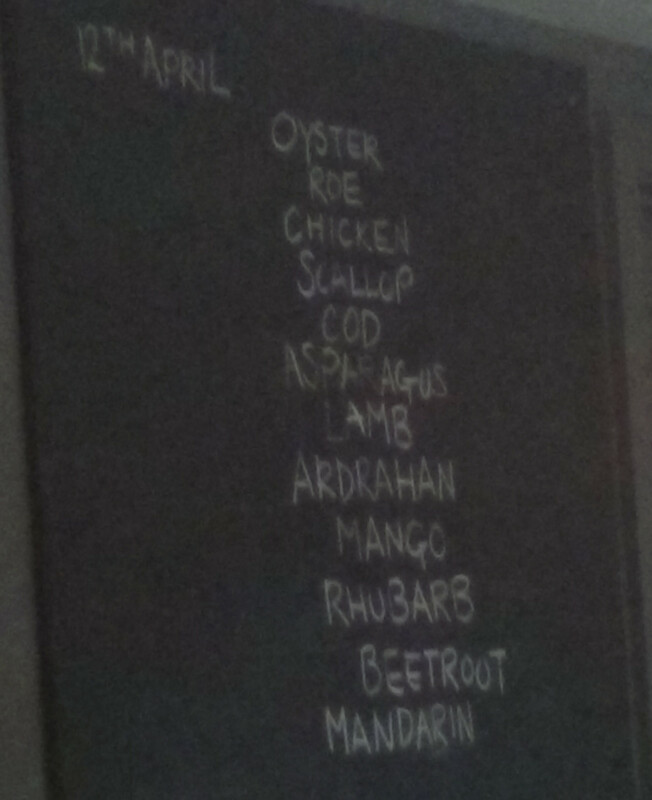 At the back of the room is a blackboard, and under the days date 12 courses were listed, each a single ingredient name. The evening is highly personal, with the dishes being announcing by James, and the team interacting with guests throughout the evening. We began with a glass of Balfour Rose and proceed to watch an apple being rotated and shaved into long strips using a nifty Chinese gadget I now know exists. These strips were laid out, dressed, a single poached oyster added and these were then rolled up to form the first course, Oyster. Along side, a poached parsnip was used instead of an oyster to create my wife's dish. The dish was a pleasing burst of fresh flavours, crisp apple, salty and sweet oyster, and my wife enjoyed the parsnip greatly. 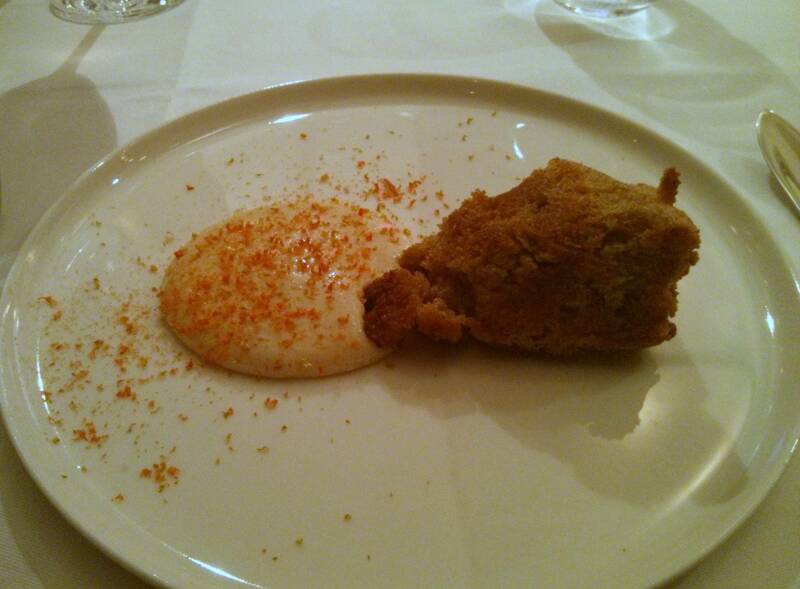 Following this was an incredible dish, cod roe smoked in house puree was sprinkled with a gratings umami rich dried scallop and served with a hunk of fried brown bread. 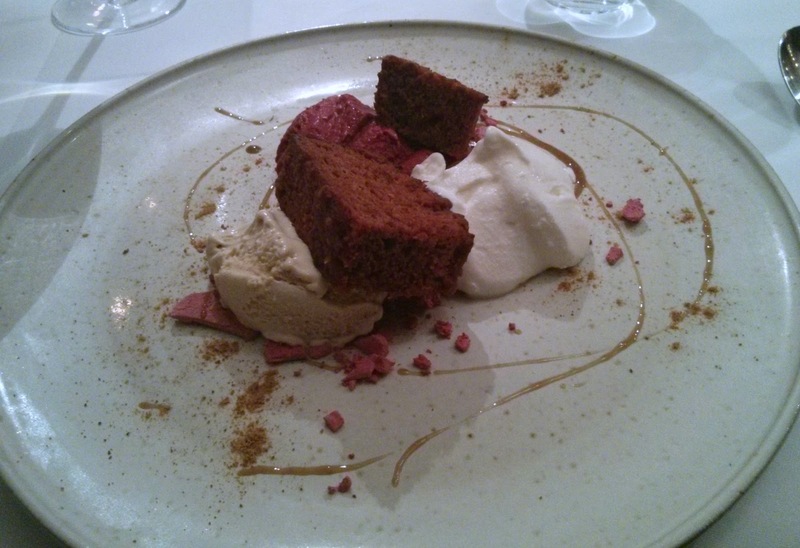 Rich and indulgent, this was heavenly combination, with an excellent depth of flavour. 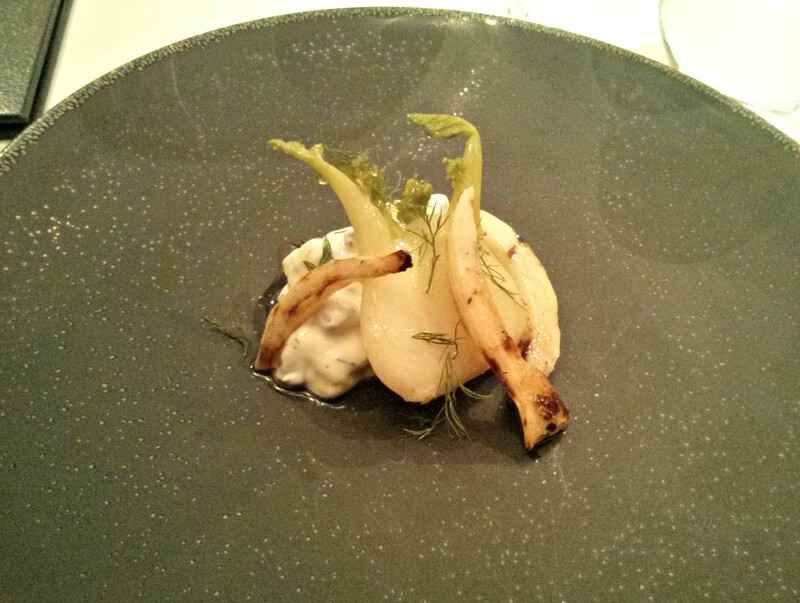 I loved this dish, a turbocharged version of an old favourite Taramosalata. For my wife an equally delightful spiky artichoke puree, carefully balanced with what I believe were tiny pickled elderflower heads gave rise to an accompaniment of positive comments. Following this a dish made up of some of my favourite things, Chicken was a masterful combination of chicken skin, rosemary mascarpone and bacon jam. 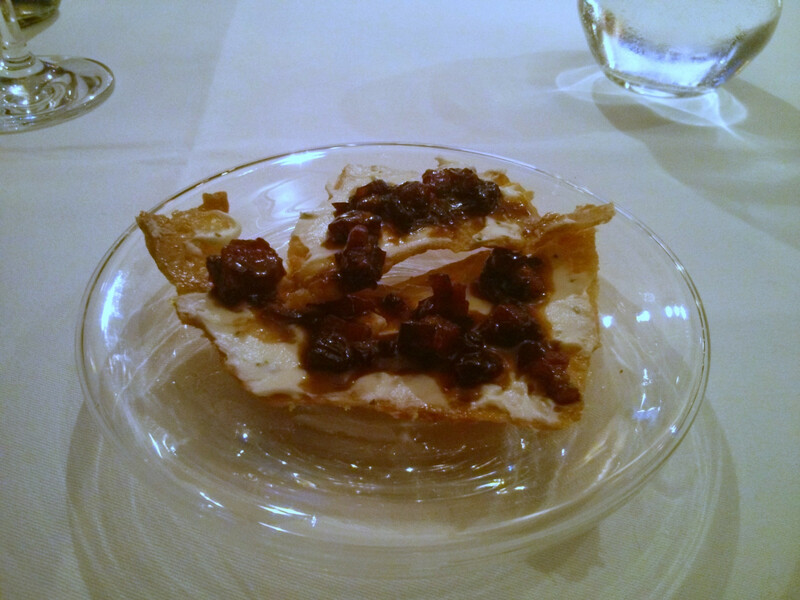 The chicken skin was crisp and captured the perfect moment of chicken that any carver of the family roast will remember, the creamy cheese balanced perfectly with bacon jam, which was basically a chutney made with bacon, a concept I look forward to trying with a whole host of meals. All elements worked brilliantly, an absolute cracker of a dish. 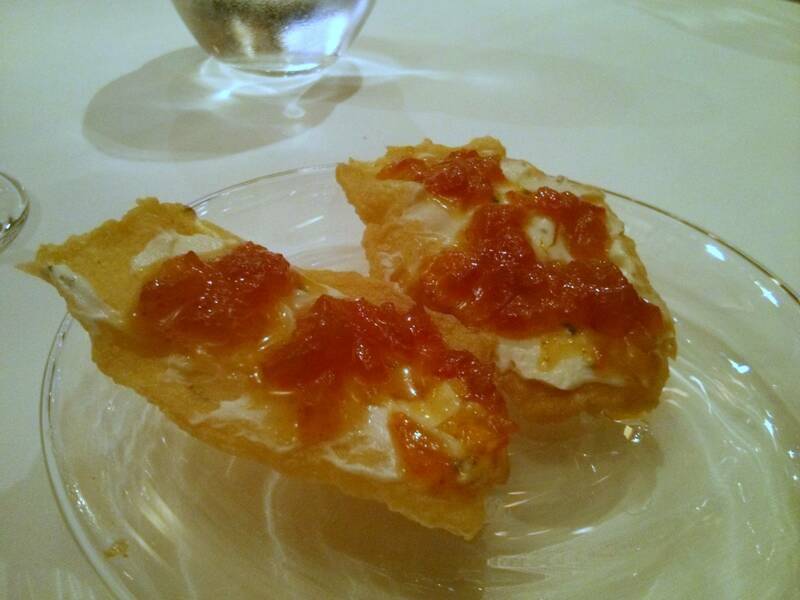 For my wife the chickpea crisp, rosemary mascarpone and an excellent roast tomato jam was a gorgeous combination. 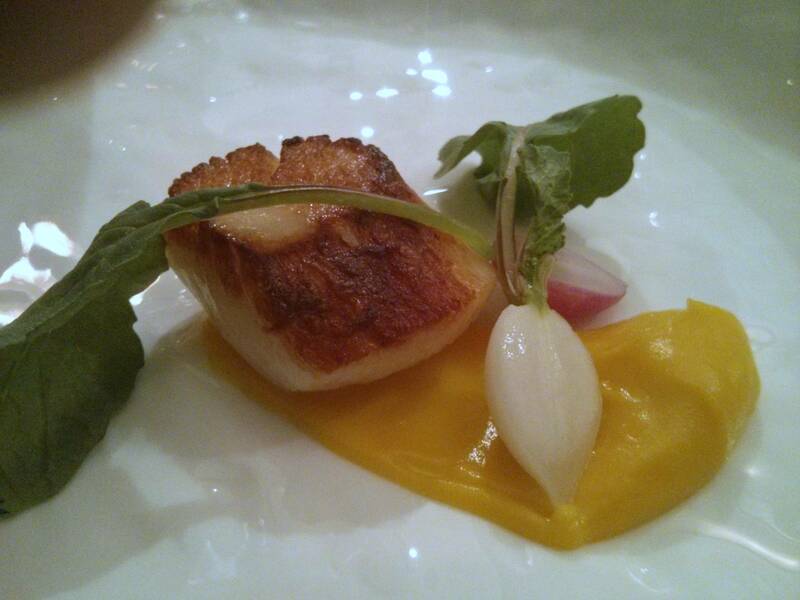 Next up, scallop with a bergamot puree and baby radish. The scallop was well timed, soft and sweet with the strength of the bergamot showing precise judgement, partnering the scallop without overpowering and a beautiful match. Equally pleasing were the baby radishes. My wife's broccoli stem was soft and of good quality , reminding me somewhat of gai-lan and held good flavour with the bergamot and radish. 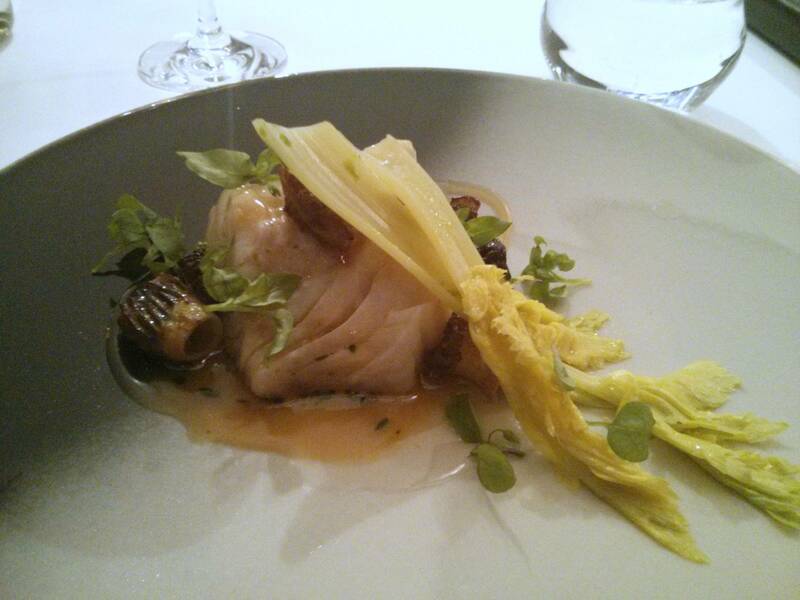 Cod was a finely timed hunk of cod neck with some stunning morels, fragrant celery stems, chickweed, parsley oil and an intense chicken gravy. 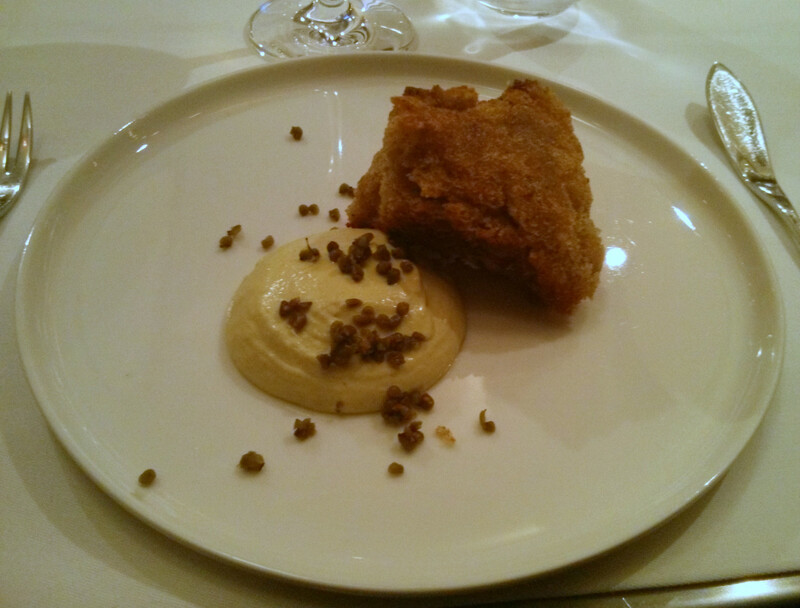 The cod was a great cut of fish, with lovely flavour and texture and the morels were extremely good, some of the best I remember, I loved the interaction with the chicken gravy with the fish and morels too. One to remember. 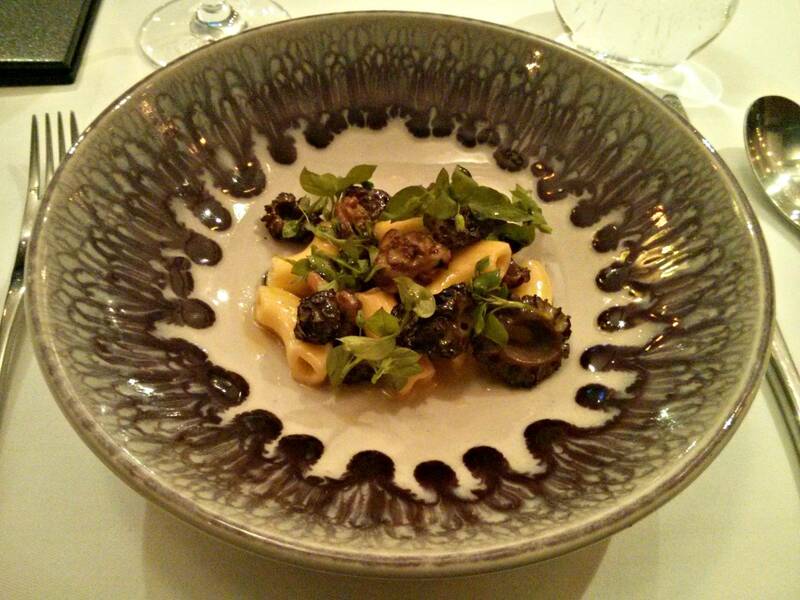 My wife had some fabulous macaroni, with chickweed, celery, parsley oil and more of those morels. She agreed with me about the morels, definitely head and shoulders above the others we've had this season. We had another glass of bubbly, a grower champagne from a small vineyard, Francoise Bedel, which was fabulous, quite different to champagnes I've had before. 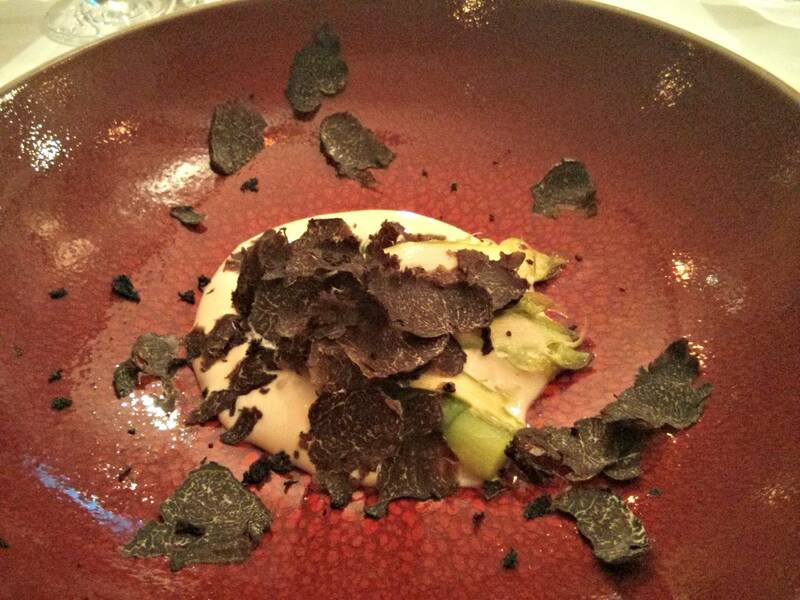 We both had the same dish next, this was the second day of English asparagus, and it was served lightly blanched and raw with a cream of aged parmesan and for us a supplement of Perigord truffle. The asparagus was excellent, and went beautifully with the umami rich parmesan, the generous shavings of truffle adding the unique earthy fragrance and flavour as only truffle can. This was an excellent dish welcoming this seasons asparagus in the best possible way. 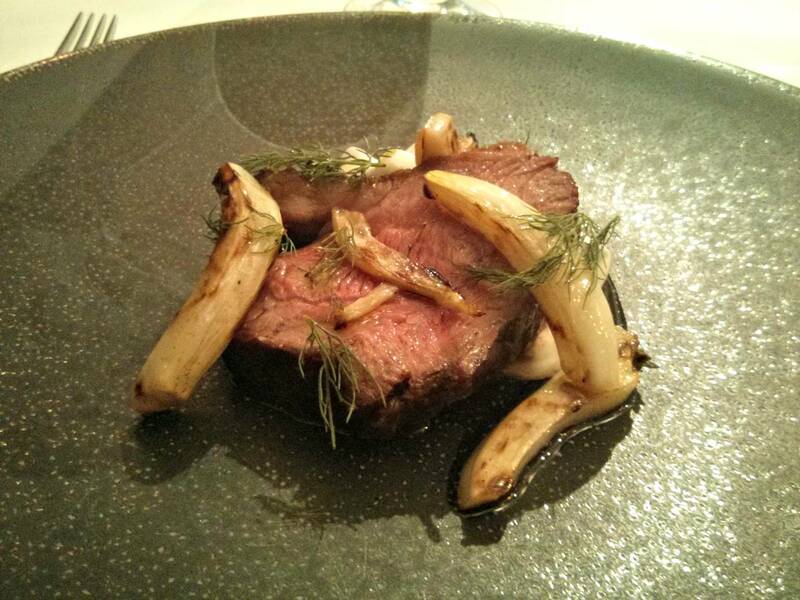 The next course was for me lamb, and for my wife heart of fennel. My Cornish lamb was barbecued and served with charred cucumber yoghurt and fennel. The chef mentioned he wanted to capture the new spring and this was done perfectly, with a truly excellent barbecue lamb being as good as it gets, with huge depth of flavour. The lovely fresh tzatziki and aniseed crunch from the fennel went wonderfully with the lamb and put me in mind of dining al fresco on a warm evening. Following this was a cheese course, although something a bit different. 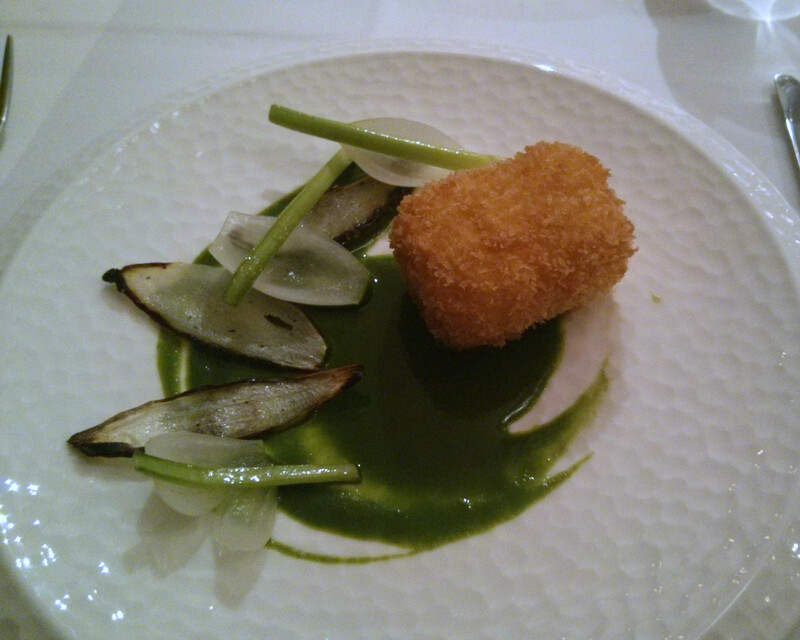 Ardrahan is an Irish washed rind cheese, this was breaded and fried, and served with a vibrant green wild garlic sauce, wild garlic stems, pickled onion and charred onion. I love melted cheese, and this was a great plate, the tart pickled onions, smoky charred onion, garlic and creamy cheese a great partnership. We asked to be recommended another glass of wine, and with the desserts had a very nice Pinon Vouvray. The first dessert was prepared in front of us using an ice shaving machine picked up by the chef in Thailand, and I also recognised it from my trips to Malaysia, where ais kacang is a popular treat. 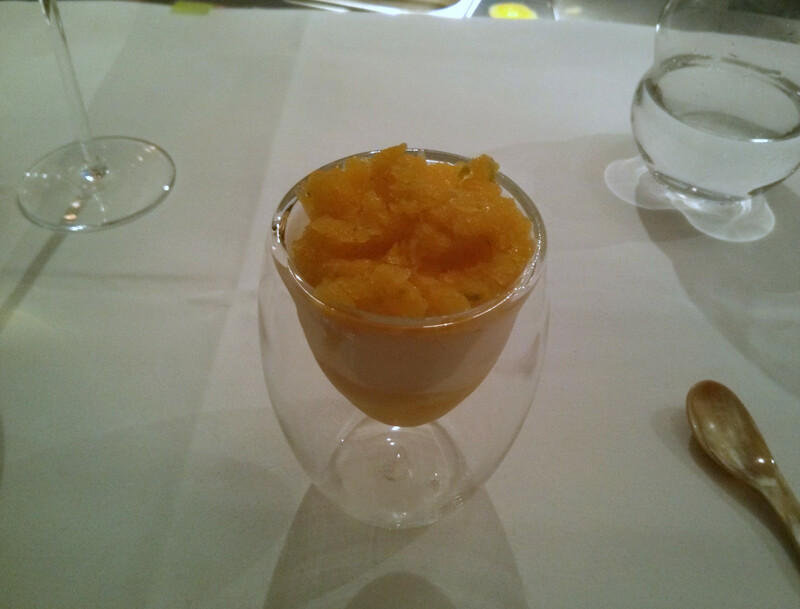 The shavings were mixed with mango, and this was piled on top of mango puree, coconut flesh and yoghurt for a superb fragrant tropical dessert and palate cleanser. 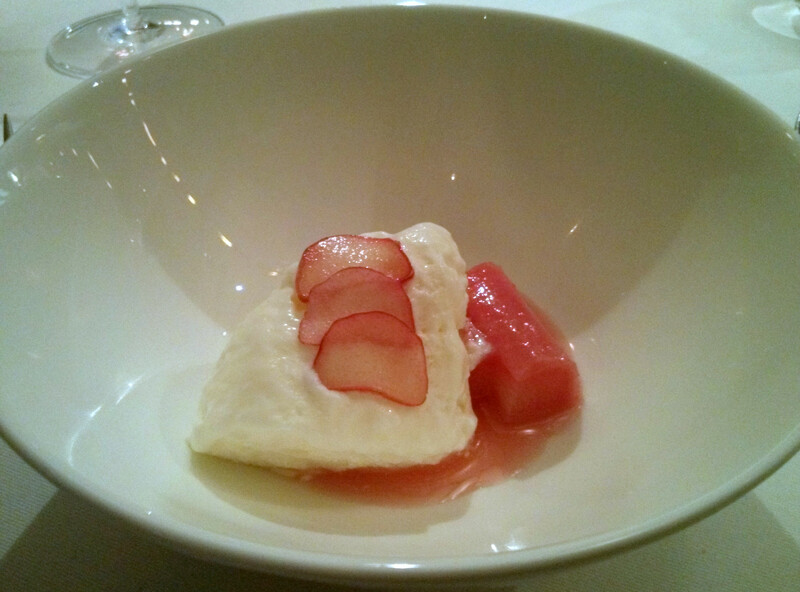 Second dessert was Yorkshire forced rhubarb and elderflower mousse, with some lovely looking and tasting rhubarb and a wonderful feather light mousse. Final dessert was quite unusual, an impressive number of elements presented in a fantastically coloured plate of warm beetroot cake, beetroot ice cream, licorice ice cream, sour cream sorbet, licorice syrup and beetroot meringue. This was one of those dishes where even if you're not keen some of the ingredients in isolation, mix together with the sum being greater than the parts, this was a very clever creation and most agreeable. My wife especially enjoyed this being a huge fan of beetroot, and mentioned that this one of her favourite desserts. We had a lovely darjeeling tea to finish, this was brewed in a single serving pot, timed using an egg timer and served in a large glass as to appreciate the quality. 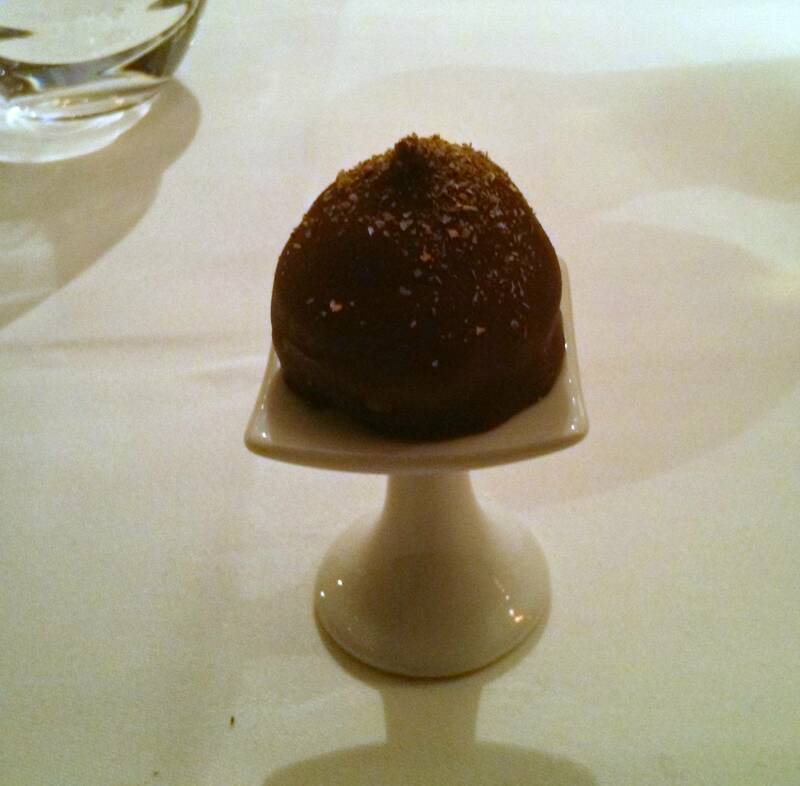 The petit four was Mandarin, a variation of a teacake with mandarin jam and biscuit, frozen marshmallow and hogweed topping the chocolate covering, a very fine example of its kind indeed. We had a really excellent evening at Kitchen Table, enjoying fantastic food and drink as well as a warm and personal service above and beyond you would ever receive at a larger restaurant. We couldn't have felt any more welcome. I loved the format of the restaurant, and this has to be the number one choice for food lovers in London, indeed, I was not the only blogger there that night. I especially enjoyed the interaction with the team, learning about how some of the ingredients are sourced, including foraging by some of the chefs and it was fascinating witnessing the technical precision and creativity at work. The chefs prepared a wonderful vegetarian menu for my wife, and we were assured that forthcoming spring and summer vegetables will offer some really exciting dishes that we will definitely be worth returning for. The bill came to £268 including service. 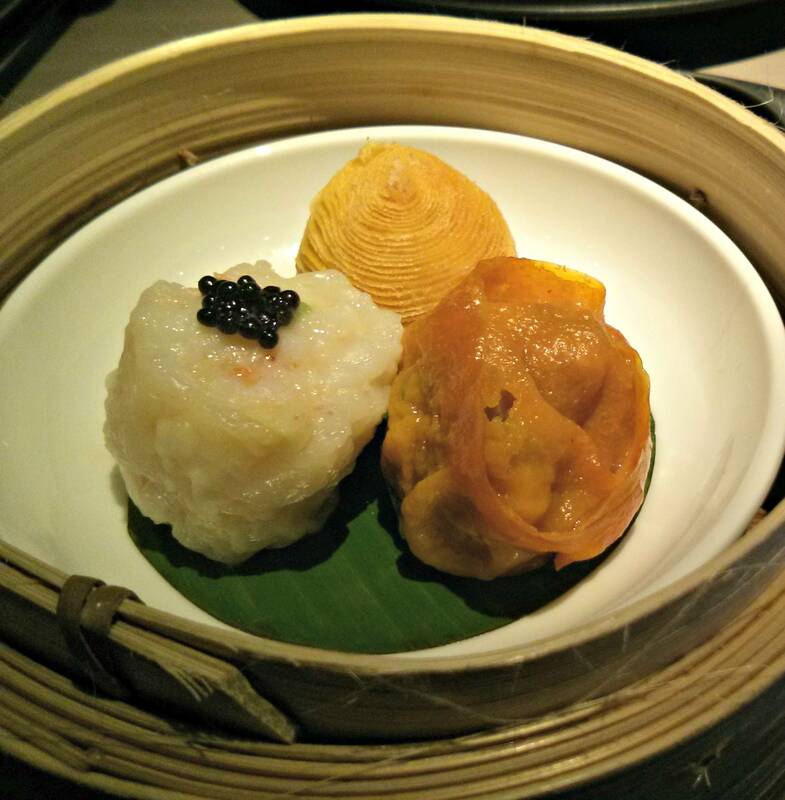 HKK is a fine dining restaurant from the Hakkasan Group overseen by Chef Tong Chee Hwee through whom Hakkasan earned its Michelin Star back in Alan Yau's day. Tong Chee Hwee is a supremely talented chef who has put together a 15 course tasting menu based on the traditions of Chinese banqueting. 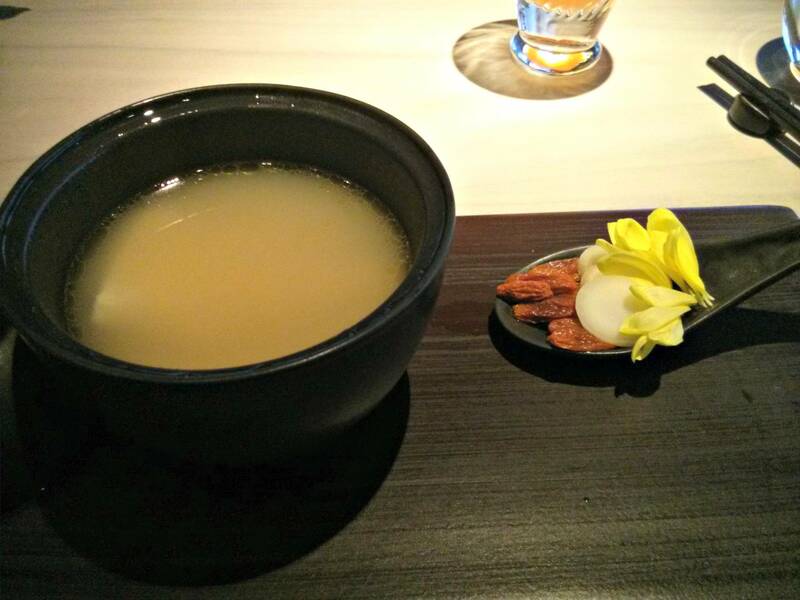 HKK also offers a la carte during lunches, but evenings are the choice of the tasting and vegetarian tasting menus only. The is a matching wine flight for each menu, as well as an original idea, an orchard flight, offering non-alcoholic fruit juice cocktails to match, which I was quite excited to try. The first drink was brought to the table, 1724 tonic water poured over saffron, with a perfume bottle atomiser adding grapefruit essence. The water went a lovely golden colour from the saffron, and had a good taste of grapefruit. An excellent start. 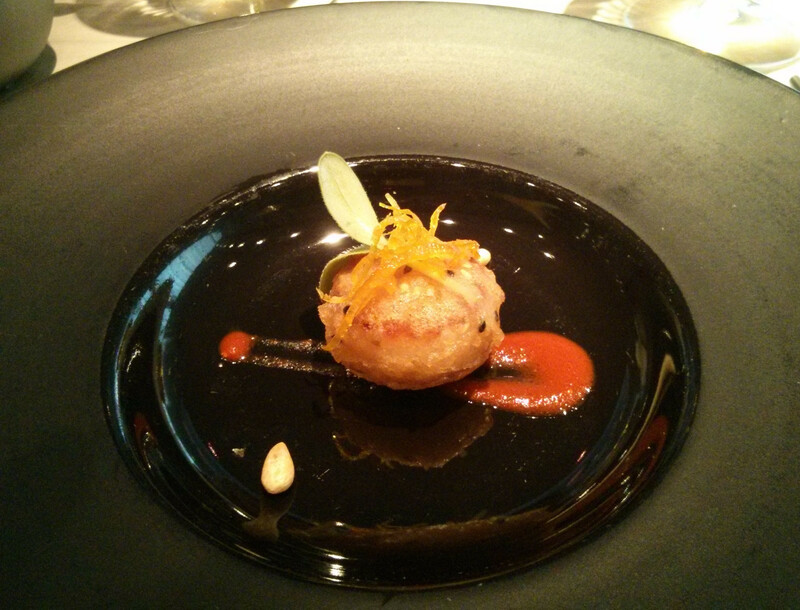 Appetisers started with a delicious Bai hua prawn for me, a prawn in a crisp batter with a sweet goji berry sauce and some roasted pine nuts. 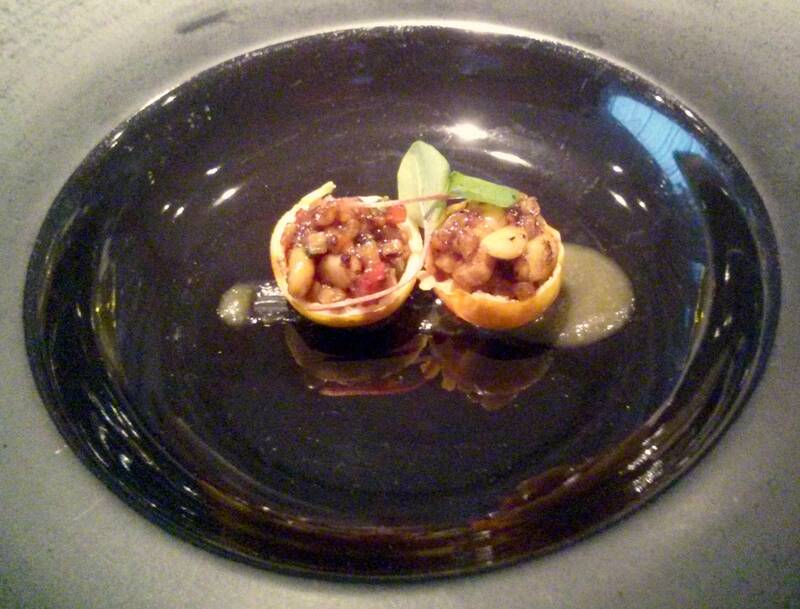 Vegetarian option was Suan-tian-ku-la tomato, a delightful little yellow cherry tomato, hollowed out and filled with pine nuts and mushroom. Following this an excellent cold dish, drunken chicken. 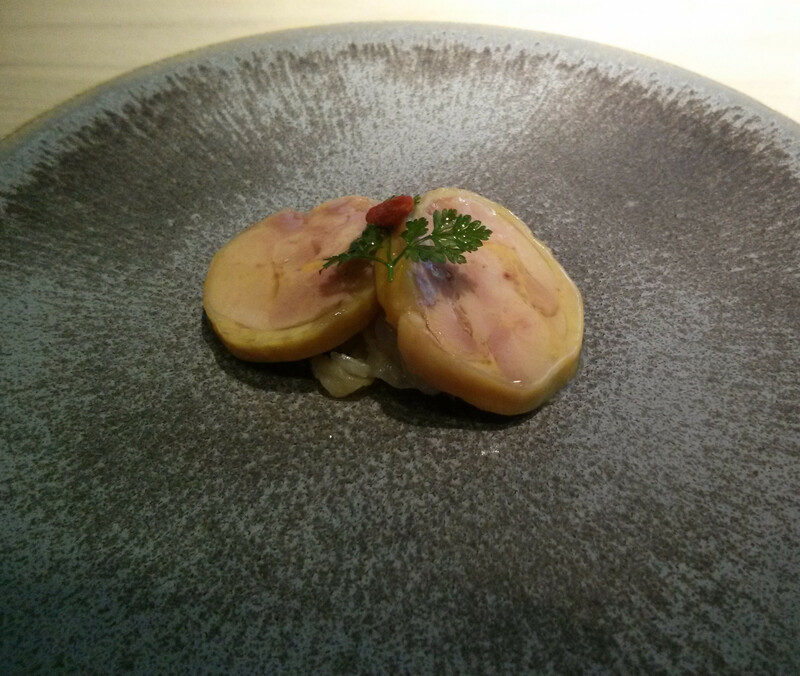 This was Poulet de Bresse marinaded in 20 year old Gu-yue-long-shan rice wine and served on a bed of jelly fish. Jelly fish was a lovely texture, slippery, crunchy and gelatinous with a subtle ocean taste but not a distinct flavour. This was a lot more delicate than jelly fish I've had previously. The chicken itself was excellent, the use of Poulet de Bresse apparent. My wife had a delicate and visually stunning salad of lotus roots, cloud ear (a gelatinous fungus) and lily bulb served in a extremely fine lacy cradle of lotus root. Following this, the much talked about Dim Sum Trilogy. 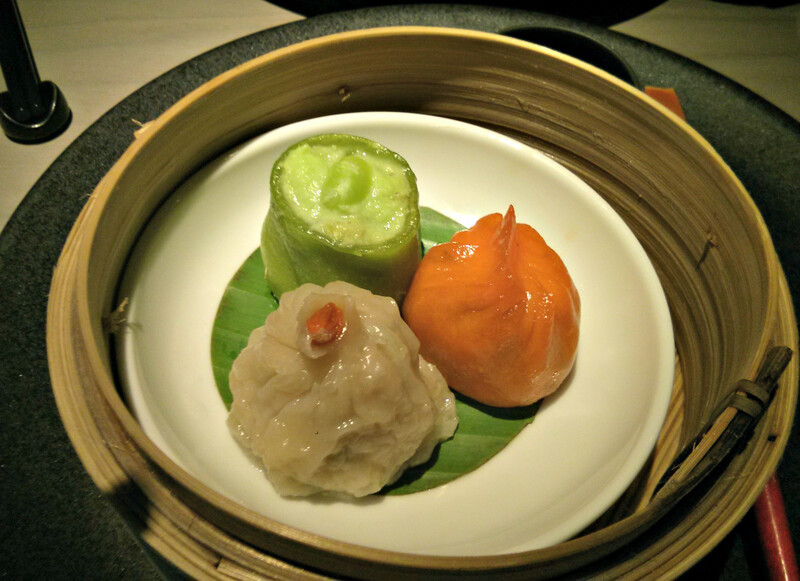 3 dim sum along with a paint brush to coat the dim sum with a sweet soy sauce. 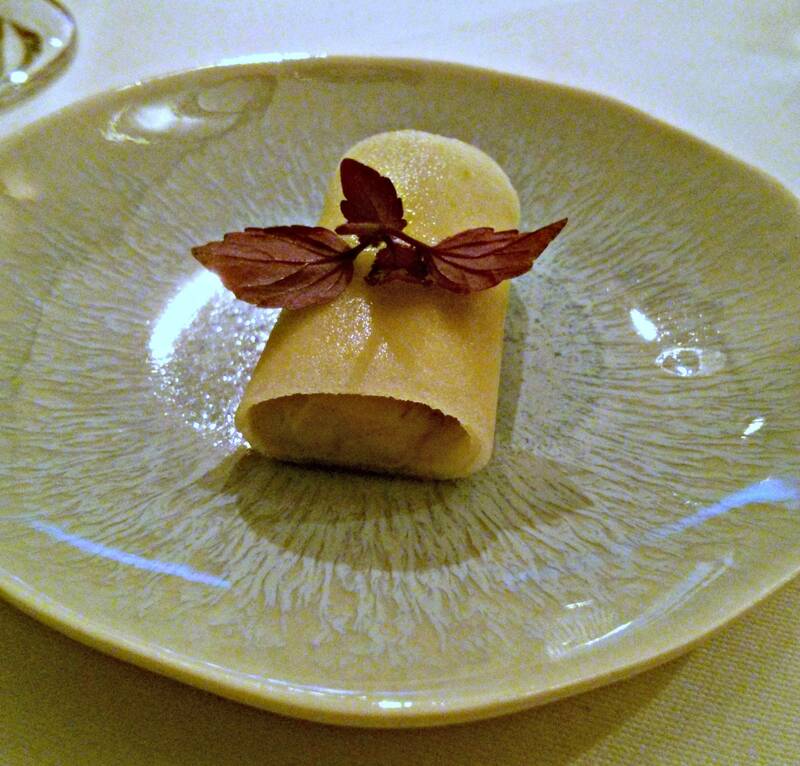 The lobster scallop and caviar dumpling was delicious, as was the high technical layered pastry and daikon. 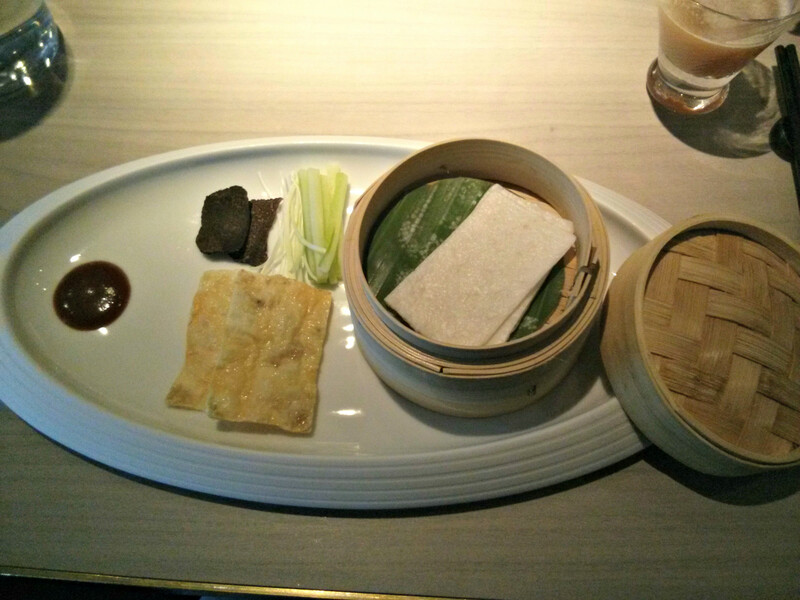 The vegetarian version included a fabulous truffled mushroom dumpling, and a vibrant and fresh edmame dumpling. Stir fry of gai-lan, shimeji mushroom and lily bulb in XO sauce took me back to holidays in the Far East, I'd forgotten about XO sauce and the flavour from the dried scallop, and had a moment where it took me back to some fond memories of meals in Singapore and Penang, the gai-lan was superb, cooked perfectly. For my wife, steamed luffa melon, very similar to cucumber as they are from the same family, but lifted by aubergine and chili. 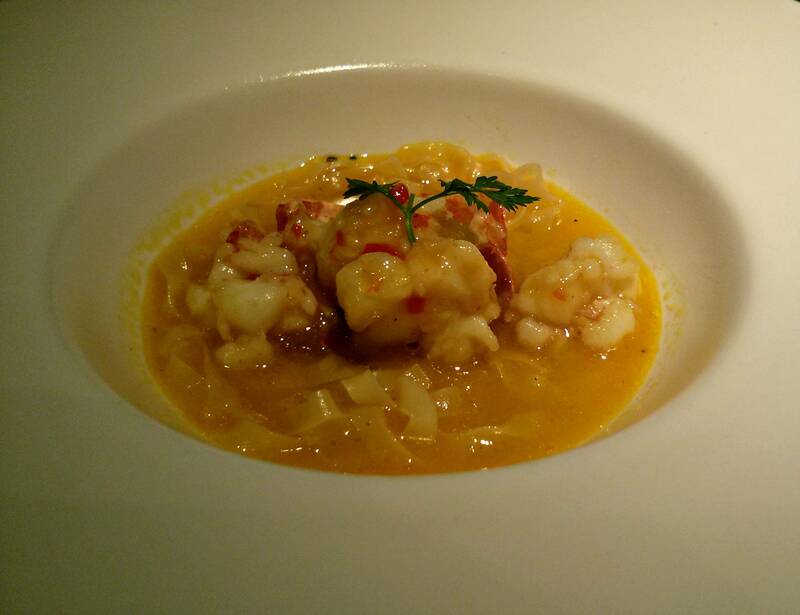 I then had an excellent lobster noodle dish, very tender lobster with homemade glass noodles and a yellow bean sauce. The vegetarian option was extremely good, vegetarian chicken, with a texture very similar to chicken was mixed with soy beans in a black pepper sauce and baked in a hollowed out red onion. This was intensely savoury and had captured some of the flavours and tastes I would associate with caramelization and maillard reactions from roasting meats whilst being a vegetarian dish, very clever stuff. A palate cleanser of hot and crispy taro milk cake and jelly of perfumed osmanthus flower followed, provided with Da-Hong-Pao tea, a rare variation of wuyi oolong held in very high regard in Chinese culture worked perfectly, preparing us for the next round of dishes. 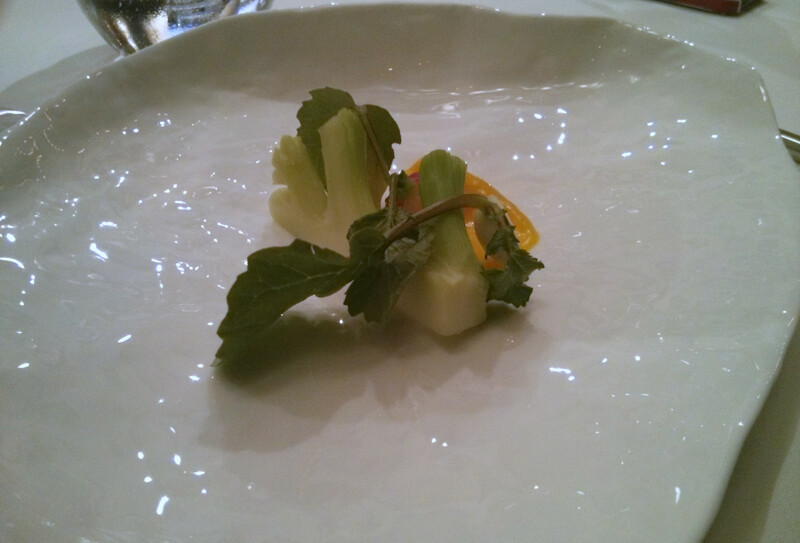 The next drink was a superb melon, celery and red pepper blend, the best of the night. 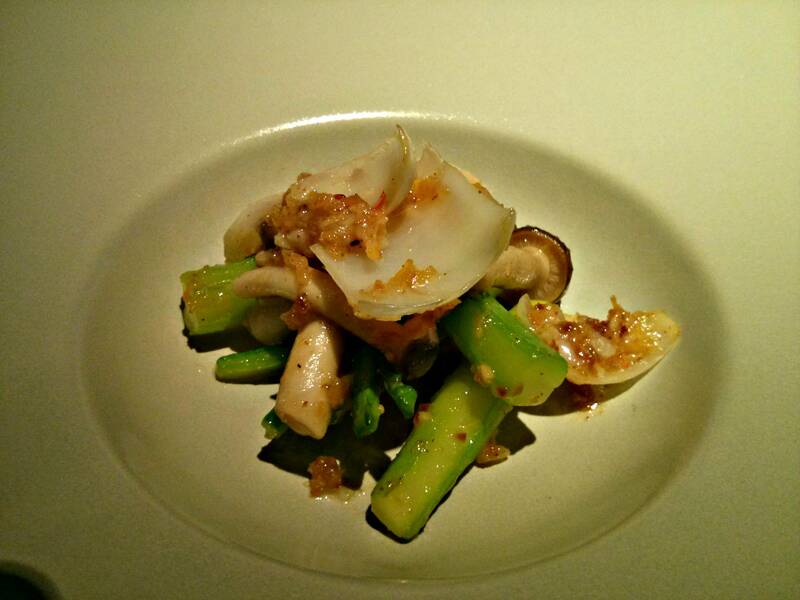 The first main was sea bass on mushrooms with a pickled chili sauce and ginger. 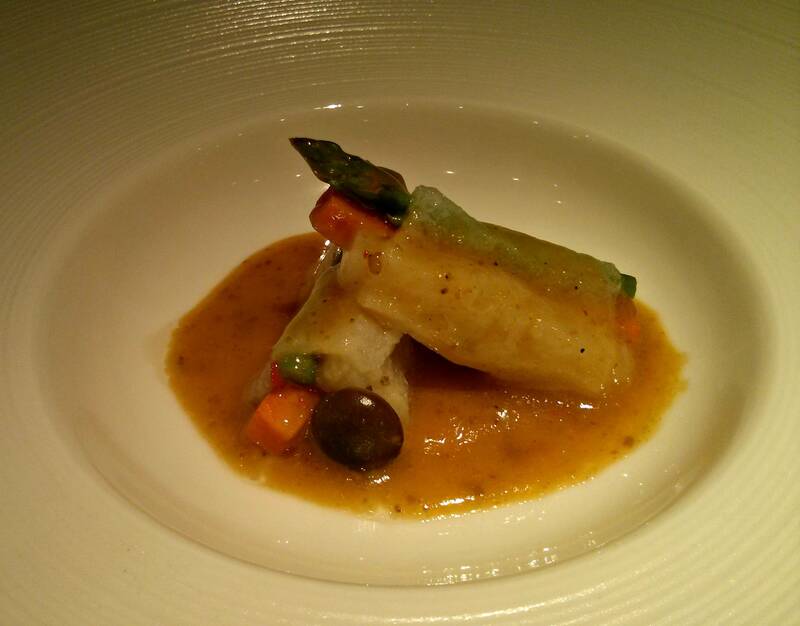 The sea bass was cooked perfectly and was an excellent refined version of sea bass with ginger I usually have. The vegetarian option was four treasure wrap, a mushroom, carrot, asparagus and daikon wrapped in bamboo pith and in spicy sha cha sauce. Following this two hot clay pots, one with pork belly, which was basically the best spare ribs I've ever had, an astonishingly good pork dish. 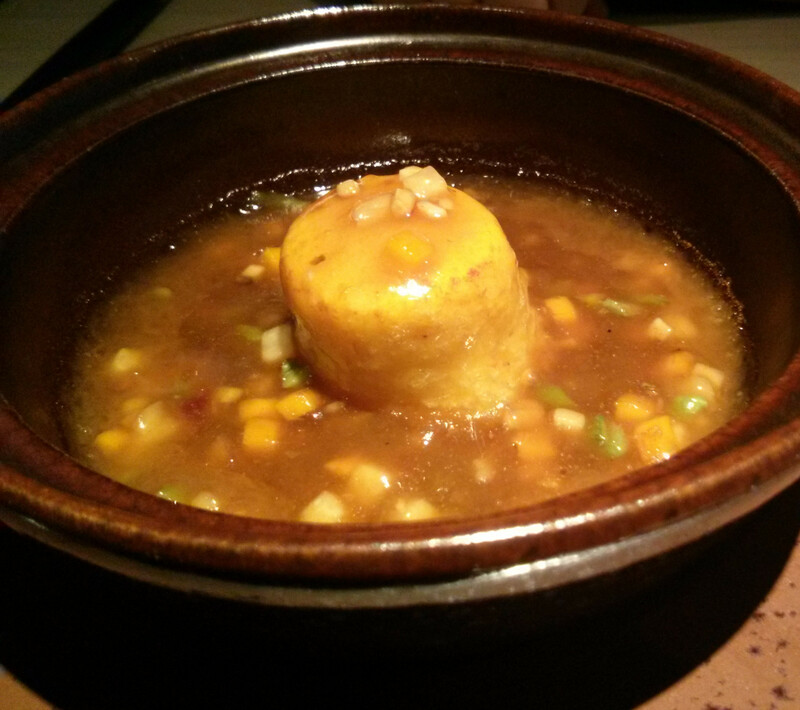 My wifes pot was a homemade pumpkin tofu, soft and delicate in great tasting sauce. The following drink was a nice blend of tamarillo, basil, cinnamon pineapple and saffron. One of the trinity of Chinese fine dining arrived next for me, abalone. 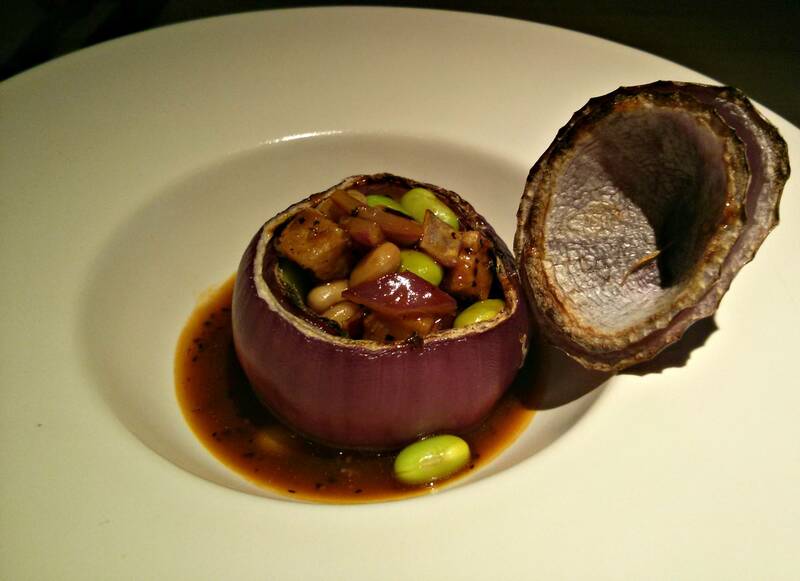 Australian green abalone was presented in an abalone shell, and came with a rice wine truffle sauce and crispy cigar of truffled pastry. The abalone was excellent, soft and tender but with a decent bite and held flavour even with a very strong truffle rice wine sauce. 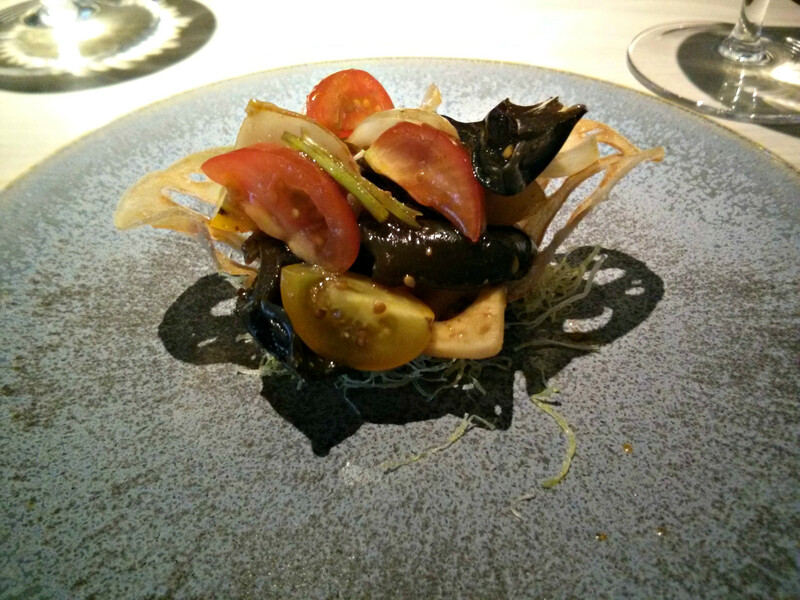 The vegetarian course was one of my wifes favourites, a large morel, stuffed and with a tempura batter was presented on a baby pak choi. This was an excellent morel, with a perfectly cooked pak choi. The sha cha sauce was savoury and spicy and matched the vegetables really well. 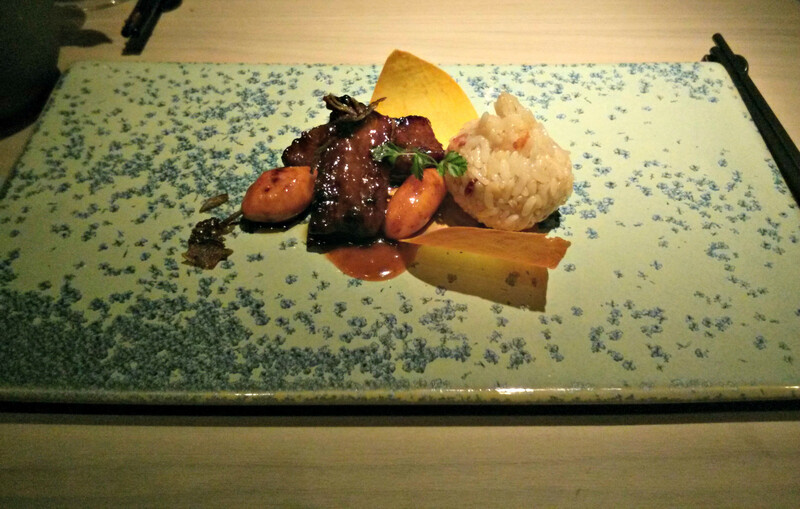 The final main course was jasmine tea smoked Wagyu beef and water chestnuts. The beef was soft as butter, very rich and fatty but with excellent flavour. The water chestnuts were turned and provided some much needed balance with richness of the beef. These came on a paper thin leaf of sweet potato and with some sticky, glutinous rice and a few deep fried jasmine tea leaves. The vegetarian version was similar, but with vegetarian duck, most likely wheat gluten although resembled duck breast in looks unlike any mock duck I've seen before. 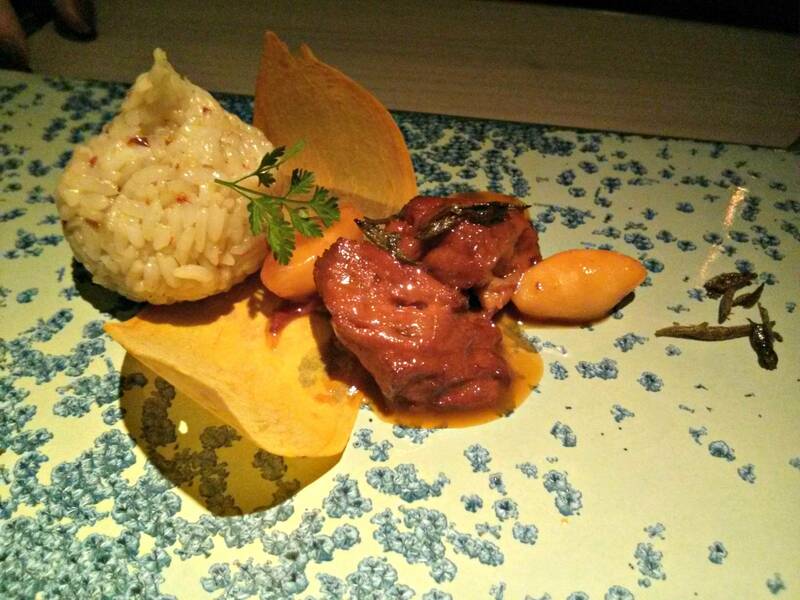 The jasmine notes in these dishes were an excellent touch. The dessert drink was a fabulous ginger, papaya, apple and eucalyptus, the eucalyptus finely judged offering flavour without overpowering. First dessert was a disc of mandarin jelly, topped with a fantastic pandan sorbet, I absolutely love pandan and this went really well with with well flavoured mandarin jelly. 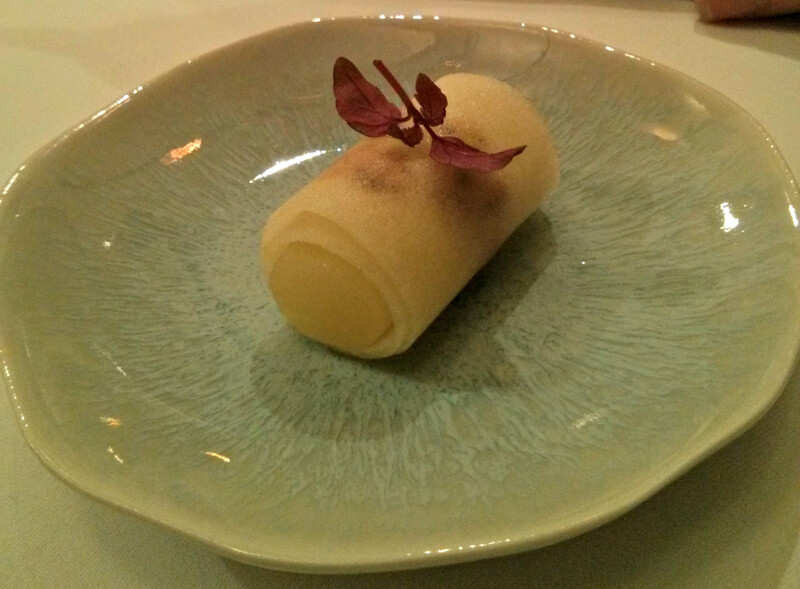 The next dessert was a cylinder of some excellent fresh pineapple, covered in angel hair pastry and fried, with some gorgeous salted lime fruit and jelly pieces, the acidity of these elements matching very well with a good vanilla ice cream. creamy and chewy macaron which I had with a decent filter coffee, and my wife with mint tea. The bill came to just over £260. HKK provided one of the best Chinese meals I've ever had, with some stand out dishes I'll remember for a long time and every course of excellence, all featuring clever balance across the flavour types so favoured in Chinese cooking but with the addition of some western ingredients, modern cooking methods and careful sourcing. I loved the orchard flight, preferring this option to wine and all matched the dishes perfectly. The vegetarian tasting menu is made up of innovative and exciting dishes, and would be recommended for any vegetarian who wants something different and wants the same quality and variety that the non-vegetarian menus provide. 20 years Gu-yue-long-shan drunken chicken and jellyfish. Lotus root, cloud ear and lily bulb salad. 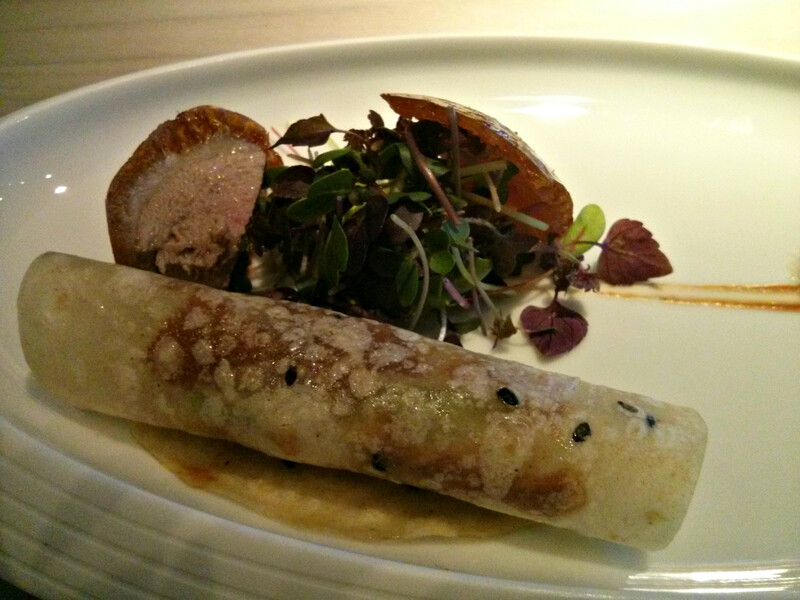 Cherry wood roasted Peking Duck. 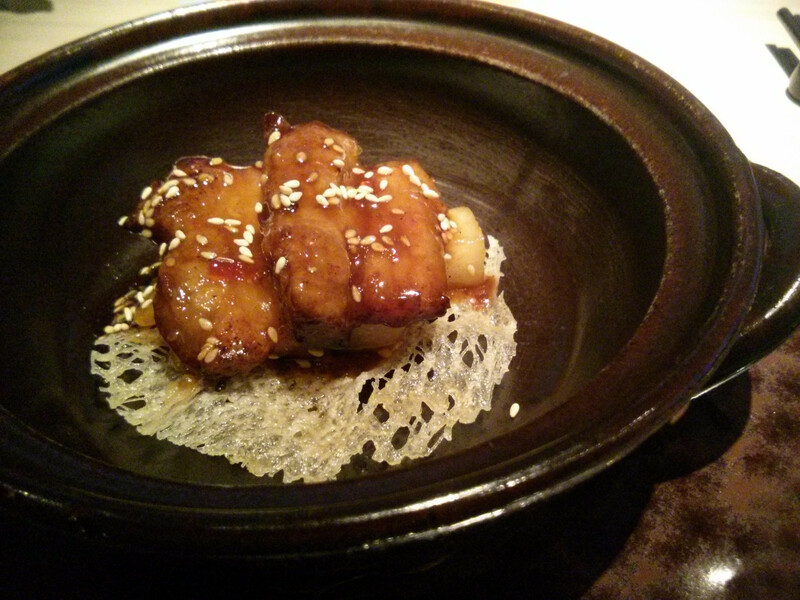 Vegetarian crispy bean curd with truffle. 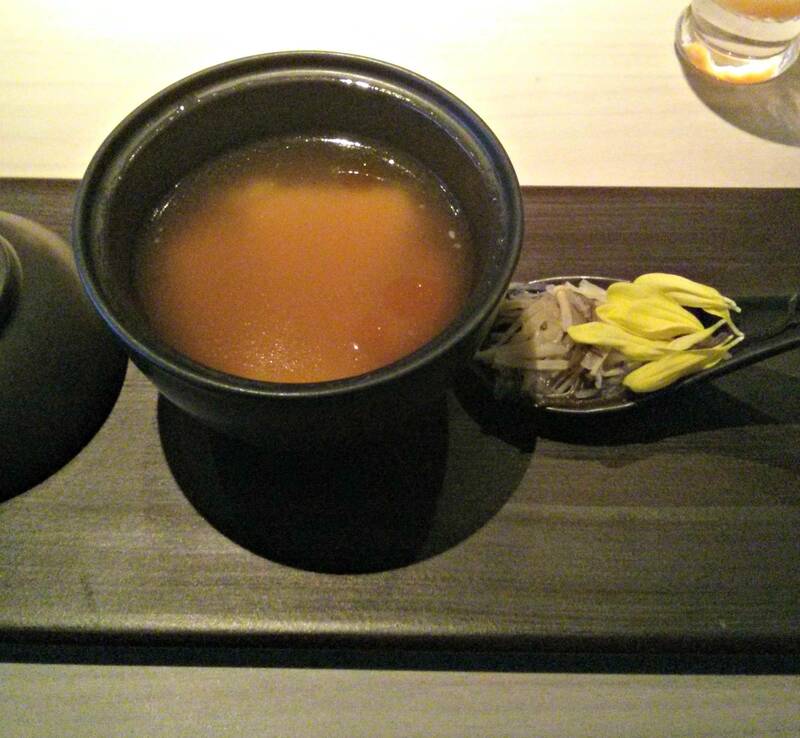 Poulet de Bresse and ginseng soup with silken bean curd. Hot and sour soup with silken bean curd. 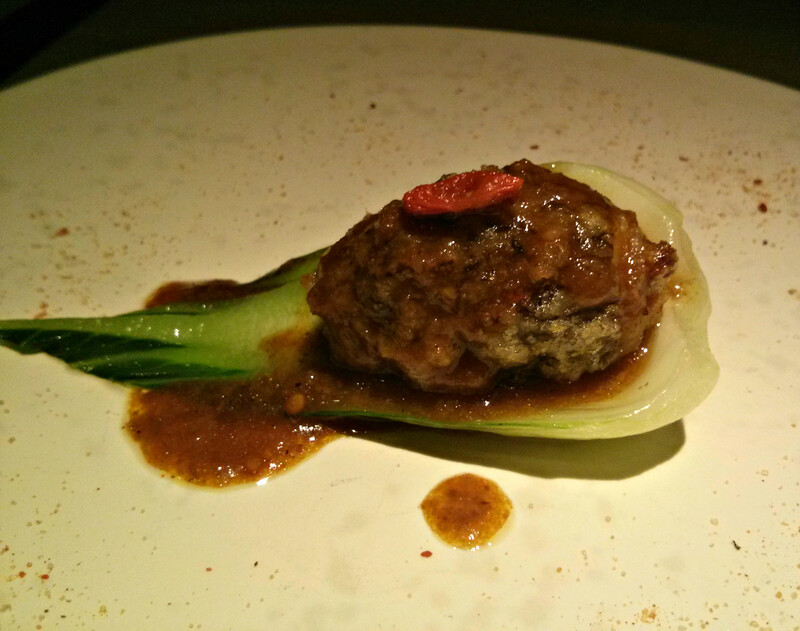 Gai-lan, shimeji mushroom and lily bulb in XO sauce. 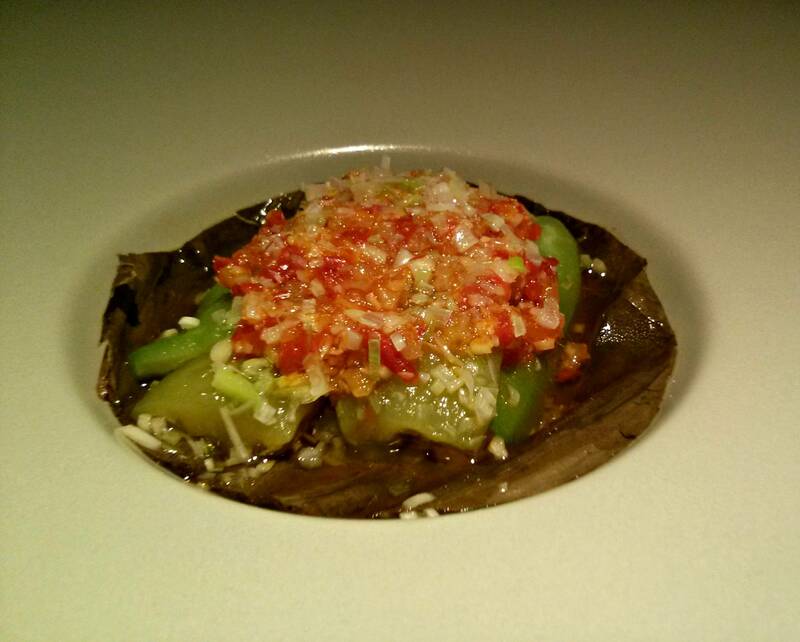 Steamed luffa melon and aubergine. Stir fried vegetarian chicken with black pepper sauce in baked onion. 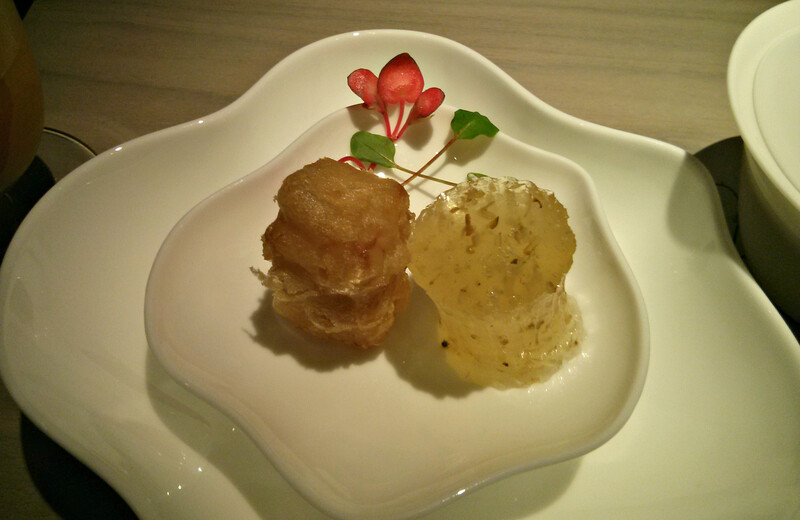 Osmanthus flower jelly, taro milk cake. 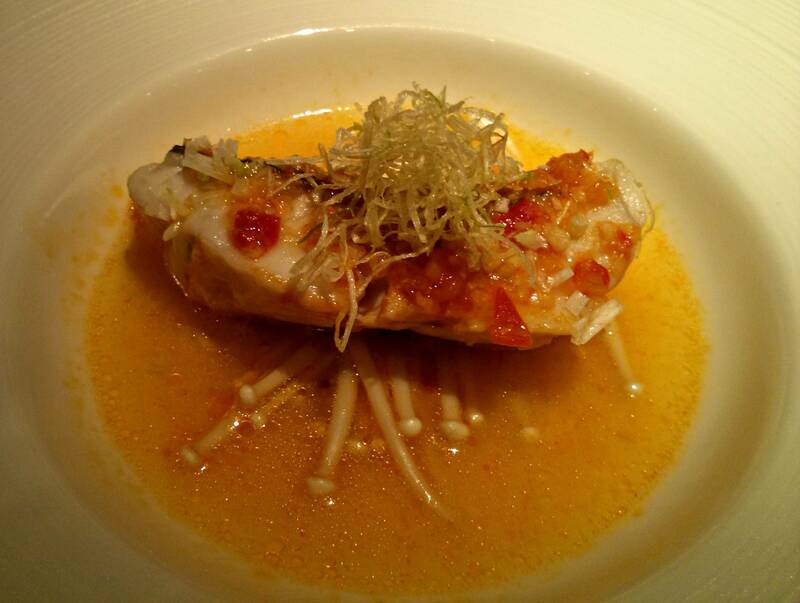 Wild Scottish Sea bass with pickled chili sauce. Four treasure with bamboo pith wrap. Toban of Rhug Farm pork belly. Toban of homemade pumpkin tofu. 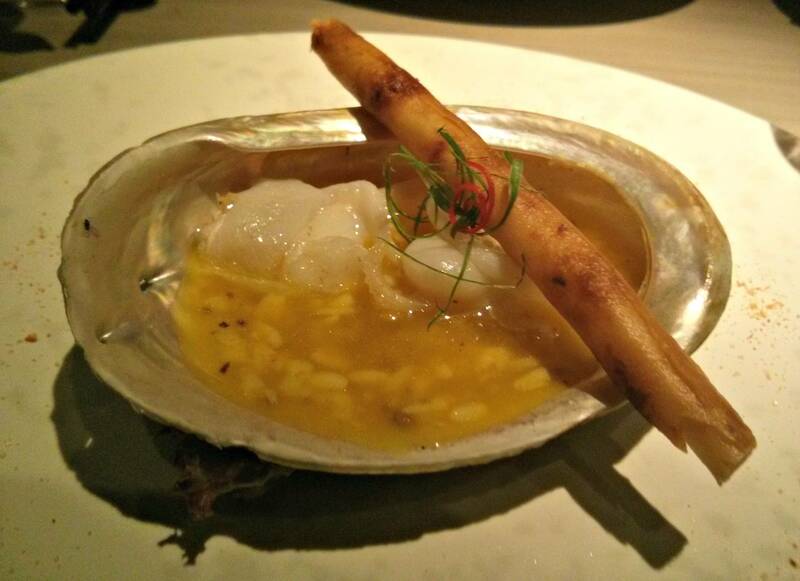 Australian Green Abalone in truffle rice wine sauce. Morel mushroom with sha cha sauce. Jasmine tea smoked Wagyu beef and water chestnut. Vegetarian duck with water chestnut. 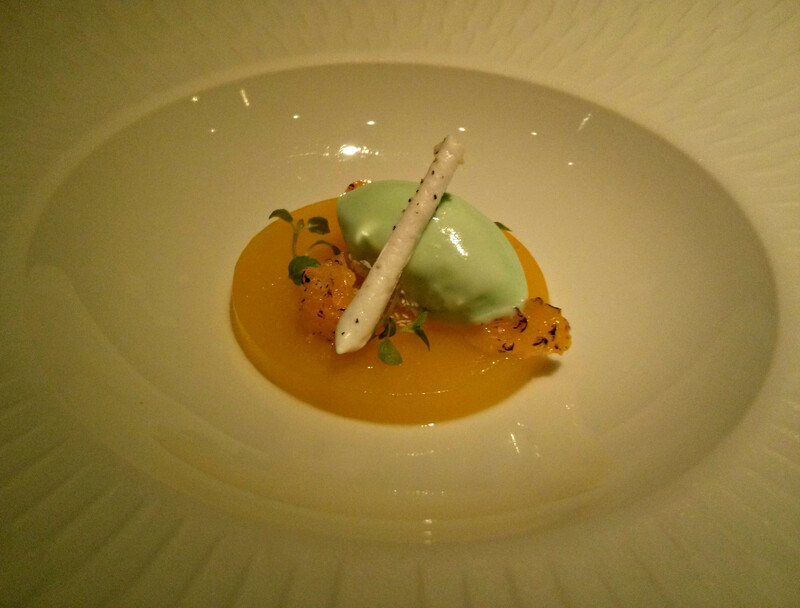 Mandarin jelly, pandan sorbet, jasmine meringue. 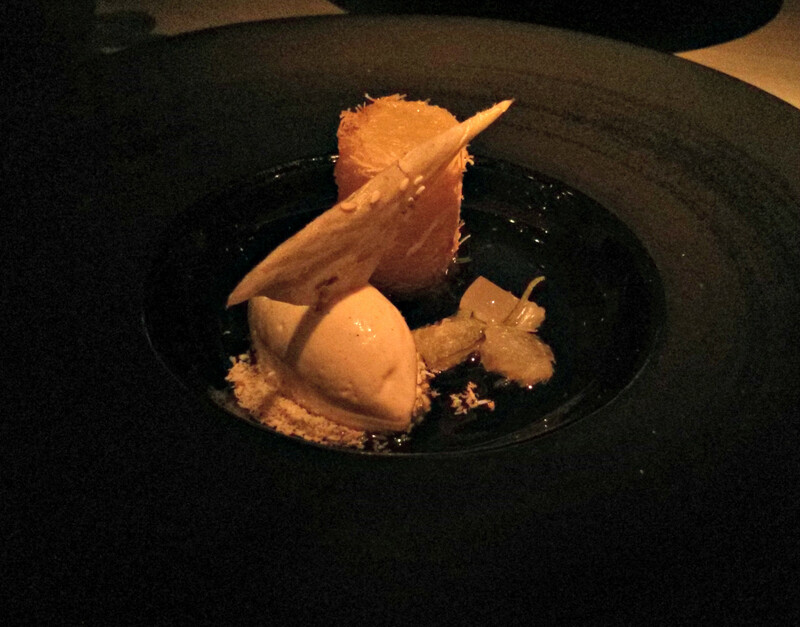 Pineapple fritter, salted lime jelly, vanilla ice cream. Please see my profile for my ethics statement. Copyright © Edesia Is Hungry 2013. All rights reserved.. Awesome Inc. theme. Powered by Blogger.